The Produce Moms continue to grow brand recognition and reach with the addition of food personality Candace Wylie. In her new role with The Produce Moms, Candace will be working with TPM founder Lori Taylor as a brand ambassador to support the initiatives and activities of TPM. In her role with Kroger, which spanned nearly 15 years, Wylie worked on customer loyalty marketing, social media and newspaper relationships. 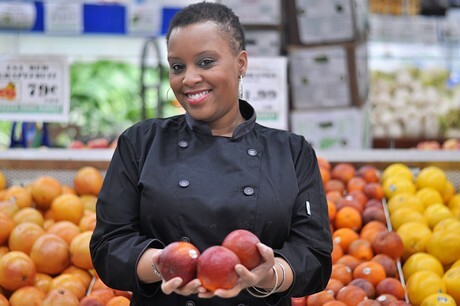 In addition to her work with Kroger, Wylie’s blog FoodLoveTog has led to her being recognized as one of America’s top African American Food Bloggers. Candace will be making her solo debut on The Produce Moms Facebook Live episode this Friday, February 23rd, at 11am EST. Candace will be preparing Simple Shrimp, Pepper & Onion. During the show, TPM will be doing another Amazon Giveaway. At the end of the broadcast, viewers who enter the keyword SWEET in the comments will be entered into a drawing to win a 3-piece Bamboo Cutting Board Set. The Produce Moms is currently vetting other personalities to bring onto the team and expects to announce additional TPM brand ambassadors throughout 2018. “By expanding our Produce Mom personalities, we are providing our consumer community and brand partners with more voices, more recipes, more perspectives and more culture; all united under the mission and interest of increasing the consumption of fresh produce,” states Lori. Currently, The Produce Moms’ 21 brand partners include Sage Fruit, Chelan Fresh, Duda Farm Fresh Foods, Kroger, Wada Farms, Grapes from California, Mann’s, Grapery, Naturipe, Monterey Mushrooms, North Bay Produce, Salad Savoy, USA Pears, Watermelon Board, Military Produce Group, Josie’s Organics, Eat Smart, HMC Farms, Pink Lady and Crunch Pak.